Justine's Cardmaking: 12 Days of Christmas *Day 3* Pretty Pink Posh Giveaway! 12 Days of Christmas *Day 3* Pretty Pink Posh Giveaway! today for the 12 Days of Christmas Day 3 I have a super fun interactive card that spins round and round and will keep the receiver so entertained! I made two different versions of the card using the Reindeer Friends and Angel Friends Stamp set from Pretty Pink Posh. Thanks so much Paulina for sponsoring today's $30 gift certificate giveaway! If you happened to have missed yesterday's card, click here to check it out! I spiced up the circle scallop die that I'm obsessed with. Honestly, every time I play with PPP, I have to pull out that die, it's one of my favourites and has had so much use! I attached all these angels to the circle die and mounted it on some plastic pieces from MFT to create a spinner. It's difficult to explain so I created a video for you! I did the same technique with the Reindeer friends. 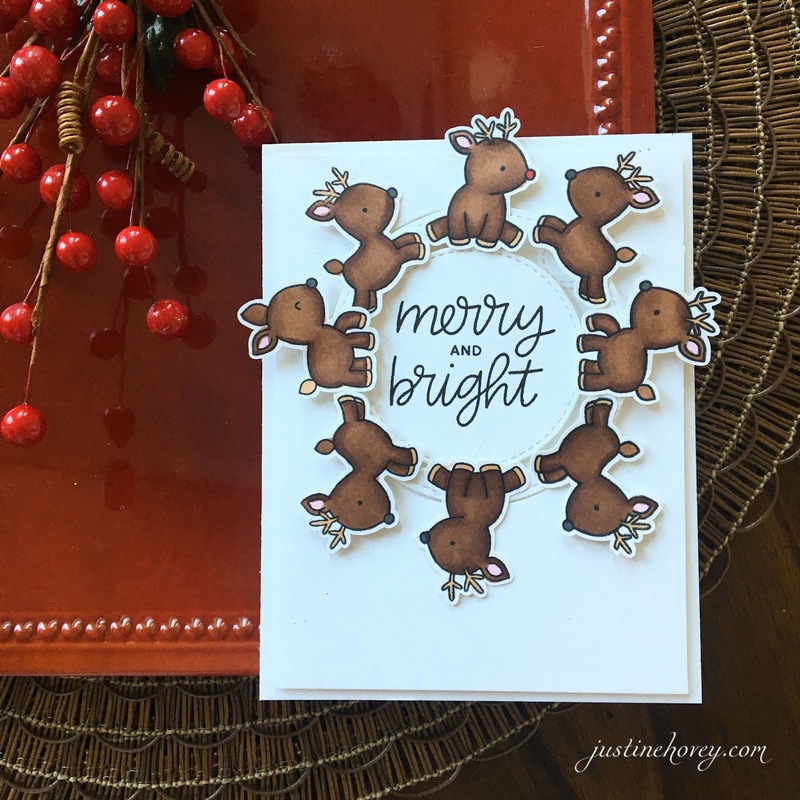 PPP makes so many cute critters so you can apply this technique to any style of card, it doesn't have to just be for Christmas. I'm no expert Copic colourist but I think I did a pretty good job on these! Thank you Pretty Pink Posh for Sponsoring Today's Giveaway! How much fun is that!! Super cute card! Awww!!!! I thought it was a lot harder to make a spinner card! Your colouring is amazing! I'm in love for these little reindeers!!! I love making spinner cards, and the idea of adding more than one element to the spinner is super cute. Thanks for sharing. Thanks Justin for your video! I love to watch these interactive card videos! Such a cute idea. Can't wait to try this with some ghosts for Halloween too! Those are adorable! That's such a cool way to make a spinner card. These are so adorable!! Thank you for the great tutorial. Such fun and adorable spinner cards, Justine! I shared your YouTube video on my FB group page, Roberta's Artistic Adventures! So Adorable! I have grandchildren and love Pretty Pink Posh's interactive line! Last year the shaker dies and stamps were just gorgeous and so fun! The kids really love interactive cards! Yeah..lol I kinda like them too! These are adorable stamps and you provided the perfect way to use them. Really cute spinner cards! Thank you so much for another great video and for a chance to win! These are just adorable. Think I'll attempt to make one myself. Thanks for the great video how to! So very cute!!! Thanks for sharing with us! Now I want to make spinner cards. Love your cards. I will be trying this, it looks fun!!!! I need to dig through my stuff and figure out what I can use to make this. Thank you Justine great card as usual. Love the spinner cards. Adults and children alike will find it to be a very special Christmas gift. add santa or kids and snowballs. so cute! thanks for sharing! Love them!! Thanks for the great tutorial! Love these fun spinner cards! PPP has so many darling stamps and I love all the sequins! These are so cute! I've never seen home crafted cards like this. Can't wait to do that!!! Nice, short and simple video... I realy like that! What a great idea! Just adorable. So cute! Can't wait to try this one! I am terrible at coloring. I wonder how I made it though my childhood. I love these cards. These would make wonderful birthday cards. Great cards Justine, thanks as always for sharing your talent and wisdom with us! These cards are just delightfully cute! Hi Justine, went to pin this and there was no image! Justine, these are adorable! Such a great way to add the unexpected element of spinning for the holidays. That might be the coolest technique I've ever seen! Thanks for sharing that. I want to try the angel card,it’s just precious. Thanks! I am in love with these cards! Thanks for more great ideas! Those angels are just too cute! Really cute cards. Got inspiration from your video!!!! I have not seen "spinners" before and they are "stinkin" cute! Loved your cards. Thanks for intoducing me to something new. Adorable! I love interactive cards! These cards are so CUTE! I have 4 blonde granddaughters. I have to make these. These are so unique! I love the design. Super cute!!! The little reindeer are my favorite!! So cute. Love the angels. Gotta try this. These are so adorable. Looks a little complicated but your video really helps. Those are adorable! I may have to make something similar for my little girl that has a birthday coming up! Adorable!! These are so cute. Would have never thought to do this! These spinner cards are so adorable! Love Pretty Pink Posh! Cute cards!Thank you for sharing! A very unique take on spinner cards! I'm excited to try this one. How cute that these spin. I like the stamps you used. I love these spinner cards and cannot stop thinking of all the possibilities using this technique! These cards are soooo cute! Thank you for sharing. I really love the products from Pretty Pink Posh! Didn't know you could make circle spinners, such fun! These are so cute! I won those sets from PPP so I would love to try these! Off to watch your video to see what else I need for the spinner. Totally cute! I’d like to make one with cute polar bears, as well. I can’t wait to get started. Such a cute idea! I love how the images are continuous around the ring. Thank you so much for sharing! Super awesome card! I love interactive cards. Thanks for sharing! I love spinner cards! I haven't learnt how to make them yet, but i'm inspired to give it a try. Love the reindeer, so cute! Such cute,fun interactive spinners! I love both of these adorable sets... they are on my wishlist. I so love these spinner interactive cards....such fun!!! Such fun cards, I love the cute reindeer, thank you for sharing. These are truly precious cards Justine, I love interactive cards, esp when they are this cute and easy to make. Thanks for sharing the tips. Such a great idea, so cute. I really enjoy your videos. I'm glad I found your channel! I love the reindeer card it's so cute! How cute are these?! Love the deer! Adorable cards Justine! I love Pretty Pink Posh stamps! Fun, fun technique, and I appreciate the tips on the 3D foam tape. Super cute cards. Oh, how fun! Think of all the cute things that could be used on the wheel....sweet little critters, snowflakes...so many choices. Thanks for the great video tutorial! I too love the scalloped circle die. cards are so cute > Just like PPP! What a clever idea!! I love interactive cards! Just watched your video and love this idea for a spinner card! What a fun idea. Love the spinners. Don't know which spinner card I like best because they are both so cute! Thank you for sharing. Both cards are wonderful. I think you did a great job with the coloring and with the cards! Thanks for the video. Thesr cards are adorable, I really want to try this technique! The spinning element is so cool. I've got to try. These cards are so adorable!! This type of card would be perfect for the teens, young adults, etc!! For example, those who you can't figure out how to make their Christmas card. I really like the reindeer stamp set!! They are so cute!! Thank you for sharing these card ideas and giveaways!!! These cards are amazing. So adorable. I especially like the reindeer! Great video. Thank you for the coloring tips. Will have to try spinner cards now that I see how they are made. Adorable cards. Your cards are so cute. A unique spinner idea. Thanks for sharing this with us. Gosh, these spinner cards are cute! Such fun cards! Super cute!!! Love this card with both the Angels and reindeer. What a great idea! SO CUTE especially if the recipient has young children! What a cute card. Thanks for sharing your talents with us. These are so cute and inventive! You are an absolute genius Justine!! I adore these cards and cannot wait to give this technique a try!!! Am totally in love with this series also!!! Thank you so much for doing it for us!! These cards are super cute! Such a fun technique! These spinner cards are absolutely adorable! Love the cute little critters and interactive cards are so much fun! TFS! I just totally think your spinner cards are precious. Fun idea for interactive cards. I need to go through my stash for more ideas. Anything can be used for this. I absolutely love this card. Thank you for sharing. Awwww your circle spinner cards are so cute! That reindeer is simply adorable. The the spinner parts from MFT make the whole thing soooo much easier! I love spinners & yours are so cute! The coloring is great too! Thanks for sharing these great creations! I love spinner cards! I did the ninja/spider card a while back. I'm going to try your technique with mermaids. 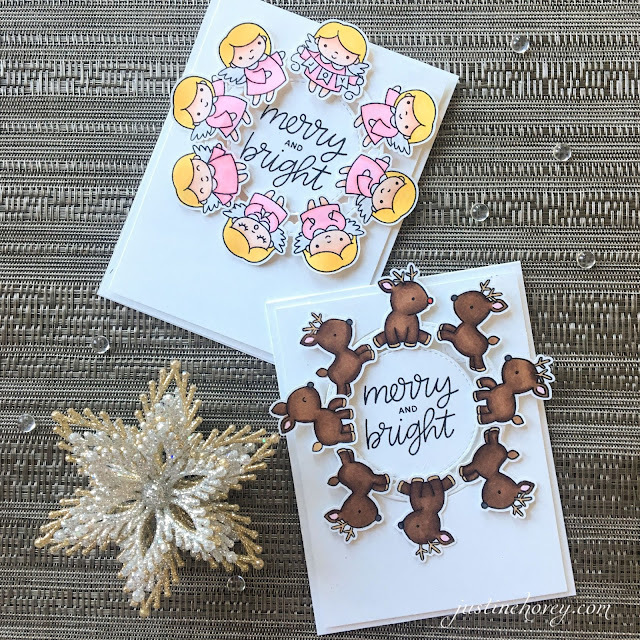 Oh I love these spinner cards, adorable reindeer and angels! Thanks for the video tutorial, easier to see it constructed to figure out how to create them. Such a creative way to make a wreath on a card! Thanks for the video. It makes the directions very clear. Your cards are just lovely. Adorable spinner cards!! Thanks so much for sharing your knowledge of how to put these things together correctly!! Fabulous! I love these... I will definitely be trying it out! These are the sweetest! I love this design too, and hope to CASE it soon. What a fun card to send to anyone! So cute!! I love the spinner idea-so clever! What a fun card! I am going to have to try this! So VERY creative...I love it! Those cards are fantastic. i've never made a spinner before. Thanks for sharing your techniques. SUPER FANTASTIC card. Willl te this for sure. Thank you for sharing! Adorable cards! I really appreciate that you tell us about your mistakes and what we should avoid in making our cards. Thanks for sharing! These interactive cards are so fun! They are not as difficult to make as I thought they would be. So cute, adorable and fun!! Thank you for sharing! So adorable! Love your videos! Awesome idea, thanks for inspiration! Such a cute idea, I can’t decide which one I like more......I think they are equal & perfect!!!! I love both cards but those angels are so adorable!! I watched this video the other day and immediately wanted to try to make one of these spinner cards. Love the reindeer - so cute! Thanks for the inspiration Justine! These are inspiring and so adorable! Love them! I really like these they would be cute for my grandkids. This is so cool! I am thinking of how to make this for my wonderful daughter-in-love! I can't wait to try this! Thank you so much. These reindeer are just so cute!! This is such a cute idea. Those PPP reindeer are A-dorable. I love the reindeer! Thanks for sharing! I love this idea! the reindeer are so cute! These cards are so cute! I love the reindeer card. The reindeer card is so cute! I wouldn't mind making something like this to give away. Those reindeers are so cute! So creative! Love the cards. This reindeer are adore! Love the ring of them! I love interactive cards, and I haven't seen this type of spinner card before. They both look fantastic. This spinner card is a new type for me! and look awesone! These cards are so adorable. I love the spinner element and how you used things in your stash.